More than 1,000 supporters and their distinguished guests gathered in the secluded Danish countryside September 5 to dedicate Europe’s new Continental Narconon on a 16-acre estate on Lake Arresø. as the assembled guests awaited the dedication of Narconon Europe. Cheers erupted as the ribbon came down, opening the new Continental Narconon to serve all the nations of Europe. The ribbon fell, signaling the opening of Europe’s new Continental Narconon and was met with unbridled exhilaration. The crowd surged through the newly opened doors of the Continental Narconon for Europe, eager to see the facilities and learn more about the program. Narconon welcomes students from across the 50 nations of Europe. Narconon Europe also provides training for Narconon rehabilitation specialists who will helm future centers across Europe. The New Life Detoxification center is the pivotal component of the program—an exact regimen of exercise, sauna and nutrition that rids the body of residual toxins and chemicals. Originally a resort, the property is distinguished by classic Scandinavian design. In the spacious auditorium, with its panoramic view of Lake Arresø, the largest lake in Denmark, students and those training to helm Narconon centers attend events and student graduations. Everything is configured to provide the stability and comfort students need to help free themselves from addiction and rebuild their lives without drugs. The Narconon Europe dining room is beautifully appointed to provide students with a comfortable, aesthetic environment. , every amenity is designed with complete and successful rehabilitation in mind. Every care has been taken to make students feel at home for the duration of their stay at Narconon. Located on a 16-acre estate in the Danish countryside, the new Continental Narconon for Europe provides an ideal, distraction-free setting for those progressing through the Narconon program. , stands on 16 stunningly beautiful acres of Danish nature, amid a pastoral forest of almost indescribably magnificent grandeur. A landmark moment in the Narconon drug rehabilitation movement unfolded Saturday, September 5, as more than 1,000 supporters and their distinguished guests gathered on Lake Arresø to dedicate the new Continental Narconon center for Europe, on 16 stunningly beautiful acres of Danish nature, amid a pastoral forest of almost indescribably magnificent grandeur. The European center is a 67,000-square-foot estate that’s ideally configured to provide an environment free of distractions to people releasing themselves from the ravages of drug and alcohol addiction. It includes a training facility to educate rehabilitation specialists who will helm future Narconon centers that promise to actively tackle the narcotics epidemic that infects all 50 nations of the European continent. 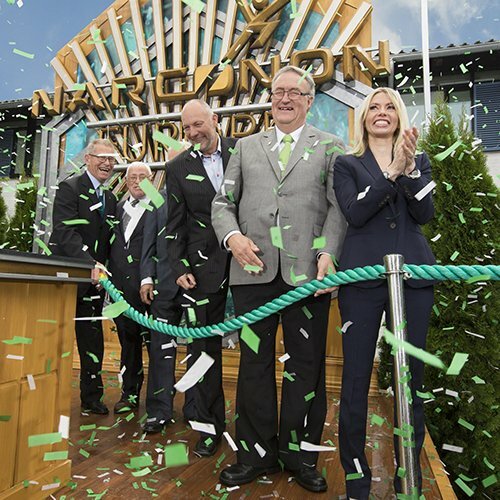 Narconon supporters and their distinguished guests gathered in the secluded Danish countryside September 5 to dedicate Europe’s new Continental Narconon on a 16-acre estate on Lake Arresø. The center opens during a period of unparalleled growth for the expansive network of Narconon drug rehabilitation centers around the world that will effectively deliver the pioneering program based on the discoveries and writings of Scientology Founder L. Ron Hubbard. It is the first of four new facilities opening over the coming weeks. The European center opening was followed hours later by a Continental Narconon rehabilitation center ribbon-cutting on a country estate in East Sussex, United Kingdom. The Continental Narconon Latin America in Mexico, established to serve the 21 nations of Latin America, opens next, soon to be followed by a Narconon facility atop the mountains of Ojai in Southern California, specifically dedicated to provide drug rehabilitation services to artists and leaders in society. Indeed, these problems are enormous. According to the European Monitoring Centre for Drugs and Drug Addiction, an estimated 1.4 million residents of the continent are problem opioid users, particularly heroin. The EMCDDA also reports an unprecedented increase over the past five years in the number, type and availability of new psychoactive substances in Europe and a concurrent surge in reports of subsequent illness and death. During the September 5 opening event on Lake Arresø, the largest lake in Denmark, Drug Abuse Consultant Mr. Leif Carlsen shared why he considers the Narconon program to be essential to society. Echoing Mr. Carlsen’s enthusiasm about the Narconon program was Dr. Stig Cronberg, an internationally recognized physician and expert in the spread of contagious diseases who is intimately familiar with the Narconon center in the southern Swedish city of Esløv. Also supplying a passionate voice of welcome at the Narconon Europe opening event was Mr. Thøger Berg Nielsen, retired Police Chief Superintendent of the Danish Police and a veteran of numerous United Nations peacekeeping missions. He saluted the Narconon program’s presence in Scandinavia. For nearly 50 years, the Narconon program has saved the lives of countless individuals who were thought lost to substance abuse forever. Its mission is to provide an effective path for drug abuse rehabilitation and to assist society in reversing the scourge of drug abuse worldwide. Narconon addresses those in the program as “students” rather than “addicts” or “victims,” and its sole purpose is to give people the tools to lead successful drug-free lives. Every detail is considered to give students the stability and comfort they need to help free them from addiction and rebuild their lives without drugs. The Narconon program begins with a drug-free, nonmedical withdrawal process designed to assist the individual in kicking a dependence on drugs as rapidly and comfortably as possible. It is followed by a distinctive method of detoxification, specifically geared to help drug users eliminate the residues that drive cravings while at the same time supporting the body with supplements. The final component of the program is a series of Life Skills Courses that furnish students the tools needed to remain drug-free throughout their lifetime. Harnessing the power of audiovisual tools to bypass literacy barriers and increase understanding, 23 instructional films in 29 dialects and languages have been created for the various parts of the Narconon program. The grand opening of the expansive new state-of-the-art European Continental Narconon center in Denmark was made possible by generous contributions from members of the International Association of Scientologists. Narconon centers operate today in 23 countries on six continents. For more information, visit narconon.org.